In the last few days, there's been a lot happening in the town of Charlotte, North Carolina. On Tuesday, reports started coming in that Charlotte police fatally shot Keith Lamont Scott, a disabled black man who was reportedly waiting in his car to pick up his son from school. The incident has sparked protests in the city, and conflicting reports from witnesses and police, so it's important to break down what we know so far. The shooting sparked immediate outrage. Charlotte police claimed that they were searching for a person with outstanding warrants on Tuesday when they came across a man leaving a car, allegedly in possession of a gun. According to The Root, police reports indicate that he "posed an imminent deadly threat to the officers." They opened fire on the man, who was later identified as Scott. The Root reported that Scott's daughter, Lyric, learned that her father was dead by the news reports as she was live-recording from the scene. Scott's brother claimed that he was holding a book, not a gun, as police alleged, and was waiting for his son to be dropped off after school. As people are waiting for what is surely a difficult video to watch, Scott's family will reportedly view the video of the shooting incident first, and then it will be decided if it should be released to the public. Scott's killing isn't the first time Charlotte has come into national attention for shooting a black man. Back in 2013, a Charlotte officer fatally shot a black man and officials charged him with voluntary manslaughter. However, the case ended in a mistrial, and he was not tried again, according to the New York Times. Scott's death also follows a recent string of police shootings of black men including, Terence Crutcher and Tyre King. 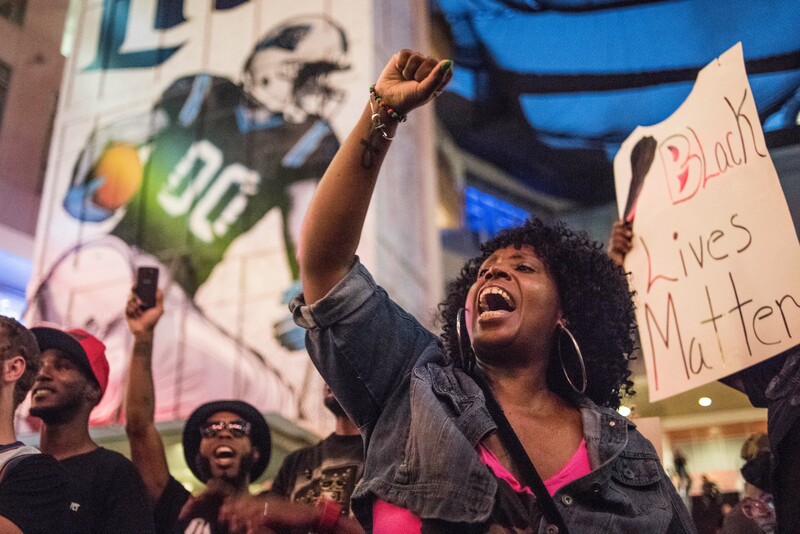 After the news of Scott's killing spread, Charlotte residents took to the streets in response to the shooting. They faced off against police, who eventually donned riot gear, and some officers allegedly used pepper spray on the crowd. About 16 officers were injured during the protests, where demonstrators were reportedly throwing rocks, bottles, and traffic cones onto Interstate 85. The New York Times reported that one person had been arrested. On Wednesday night, the protests escalated, and one person was shot. Early claims said he was dead, but now we know he's in the hospital on life support. According to New York Magazine, police have not identified the victim and it hasn't been confirmed whether he was part of the protest. Police claimed that no live ammunition was shot by officers (only tear gas), and that it was a "civilian on civilian" shooting. Charlotte's governor has declared a state of emergency following the protests. On Thursday, Charlotte-Mecklenburg Police confirmed plans to show Scott's family video of the shooting. Despite officers' claims that Scott was in possession of a weapon during the confrontation, ABC News reported that police chief Kerr Putney said the footage does not provide "definite visual evidence that would confirm that a person is pointing a gun." There's still a lot of moving parts in the investigation, and we'll have to wait to see how protests play out and if any repercussions will come from the event, but it's certainly tragic and awful that yet another black life has been lost.